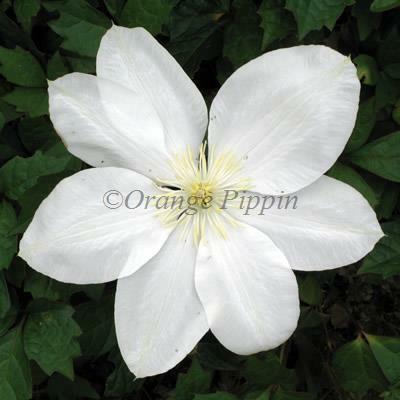 Clematis 'John Paul II' bears large cream flowers with a soft and rich pink stripe to each of the petals that have darker coloured stripes underneath, these being further set off with a burst of red from the centre of the blooms from June to September. Clematis 'John Paul II' also known as 'Jan Pawel II' was raised by Brother Stefan Franczak of Poland and introduced into the U.K. by Jim Fisk in 1982. It was named for the pope who died in 2005. In the UK this plant is almost always labelled 'John Paul II' despite being registered under the Polish name. This stunning non-evergreen climber should be allowed to climb up a tall trellis or fence, or even up through a large shrub or tree, so that you can look up and appreciate the beauty of this wonderful plant.